UCEM will ensure that we will take all reasonable steps to manage operations to minimise our environmental impact and to promote good environmental practice. Sustainability will underpin all activities and decisions that are made by UCEM with relation to our operations. The refurbishment of the UCEM office ‘Horizons’, already recognised as ‘Excellent’ on the BREEAM rating scale (the world’s leading building sustainability assessment method), has now been further recognised through a Green Apple Gold Award for our environmental and social benefits, innovation, economic and environmental impact as well as UCEM’s commitment to educating others about the project approach. This award led to UCEM becoming Green World Ambassadors, where we will be held up as a shining light ‘for helping others to help the environment’. 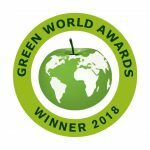 Additionally, our online sustainable project entitled ‘Sustainable futures through online learning’ was awarded ‘Highly Commended’ at the Green Gown Awards 2018. UCEM has produced an interactive case study about the project, available here via our Online Academy.